Oh man! Can't believe it's been almost three months since my last post. I usually don't go so long without throwing something out there. I have mainly been finishing up on the remodel that was started over 18 months ago. The place is looking great, and I must say, the time has been well spent. As always, I remind myself after a remodel - "man that stuff sure takes a lot of time". And as soon as the words come they are forgotten. I have been able to get out and fly through this busy year, and quite a bit. I had some respectable XC flights, one of which topped out at 80.6 miles. This flying season I have flown the Crawfords more than any other year. Due in part to the closures of several sites, but also because The Crawfords are just amazing mountains. Last weekend Cody and I got to over 10 grand several times and landed in one of the best LZ's you could ever imagine. Hopefully next year we'll get Inspo's bail out LZ back. And maybe the repairs on the road up to Francis will be finally complete. Until then, I'm content with the alternative. One other huge development is the addition of new family member! My daughter Melissa gave birth to her own daughter this year. I never imagined me being a gaga grandad, but it's happened. Sophie is here and life has once again morphed into a new shape with brand new goals, hopes and wonder. Thank God for the brand new beginnings we sometimes get to be a part of. 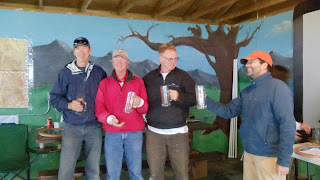 July 9th through the 16th I attended the king Mountain Hang Gliding Championship. As always, King is one of the most incredible places to fly on earth! With that being said, King can be one of the most frustrating places to fly due to summer thunderstorm activity. This year the comp was plagued by daily storms. But there were a few days that provided great flying. Our driver Sharron Lepardi and flying mate Lisa Verzella. Sharron. striking a pose at a really cool petroglyphs site. The 2012 King Mountain Championship winners. Yea that's me. After several skunks at Heber this year, yesterday yielded 80.6 miles from Heber, Utah to Mt. View, Wyoming. Lisa V and I launched within minutes of each other - around 12:45pm. We didn't hang around launch too long. Lisa was out on route at 13k, 15 minutes after taking off. Unlike many Heber XC days where a pilot is hanging out in turbulent air waiting for the right thermal to get high enough to leave, the air was relatively smooth and great thermals were abundant. I was 15 min. behind Lisa, and on glide for the cement plant (a great thermal generator 5 miles over the back) after climbing out to 11.5k. Lift was consistent all the way to Coalville (22 miles out), with climbs to 13+k. Lisa stayed ahead of me most of the flight, but our flight path to Mt. View was pretty much identical after discussing it later. At Coalville I got a bit low, but found good lift that took me from 7900 to 13k. I drifted back into Chalk Creek and worked light, unorganized lift until finding a solid core close to Porcupine Mt. I drifted NE as the thermal I was in gained strength finally topping out at 15k. The lift was over this desolate area NE of Porcupine was solid enough, that I felt confident to go on glide for Evanston. I arrived at Evanston (60 miles from launch) never getting below 13k. At this point the route follows I-80 due east from Evanston. We both had no problem making Oyster Ridge with plenty of altitude to spare. There are gigantic wind mills scattered all over this area. They were indicating a definite westerly flow. We followed I-80 east, only to find strong west winds and little to no lift. We safely landed close to the Mt. View exit, a few miles apart in 30+mph Surface winds. Tuesday April 24th, I flew my first XC flight of the season. Lisa V and I went to the Short Divide along with our driver, Sharon L. The conditions were strong at launch with the wind crossing a bit from the west. Along the route to the north were developing cloud streets with the potential for over-development. Lisa was off first and thanks to Sharon, I followed. Within a few minutes I was circling and drifting to the back ridge. I wasn't surprised to find minimum lift because of the west cross in the wind. I slowly traversed the ridge until I came to a more westerly aspect, at which point I started going up. Soon I was above the ridge and heading west to Gunsight peak. Lisa had a nice side hill landing out front after battling the conditions for 40 min. The lift wasn't that great over Gunsight. After several minutes a large cloud moved overhead, consequently shutting down any thermal production. With a strong southwesterly flow, my usual LZ was going to be hard to reach. I decided to fly to the northwest and land along I-15 where there are plenty of possible LZ's. Once over I-15 I found some light lift and began circling. I burbled my way north drifting with the light lift until I found a substantial thermal that landed me at 10 grand. I was able to continue north, and after a few more climbs to around 10g I reached Malad, Idaho. I safely landed and about two minutes later a gust front from a cell that had been developing from the west hit with winds around 30 mph. 1:45 flight / 23 miles. Just a quick vid of yesterday morning. Includes a real nice slider by Dan M..